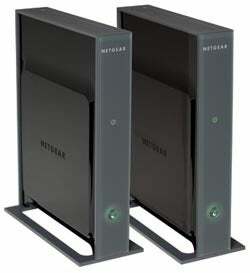 PCMag got their hands on Netgear's new 802.11n streaming rig, the The Netgear HD/Video 5 GHz Wireless-N Networking Kit. Essentially a wireless bridge with access point (no router included), the setup is intended to enable full HD streaming room to room (for ethernet-enabled media devices) or just a better wireless gaming experience (so you don't get pwnd in Halo). And after putting the system through field testing, PCMag decides they like it. Even through transfer rates vary a bit over distance, the Netgear HD/Video's sustained speeds are a lot better than its 2.4 GHz counterparts.